Work practices in which one or both parents leave the family home for an extended period of time produce a unique situation in which families must manage prolonged disruptions to family relationships, transitions in parenting roles and responsibilities, and reliance on the functioning of the at-home parent or family member. 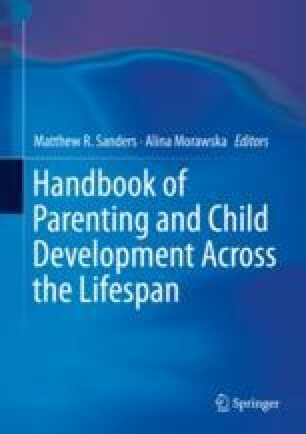 This chapter reviews theory and research on the consequences of parental separation due to work on parenting, parental mental health, family relationships, and child well-being, and identifies factors that affect outcomes for families. The review focuses on two types of parental work absences: (1) long-distance commuting (often labelled Fly-in/Fly-out (FIFO) work); and (2) military service and deployment. Overall, the literature reveals that parental work absences negatively affect the mental health of the parent who travels away for work, as well as the parent who remains at home. At-home parents may be particularly vulnerable to the use of harsh discipline practices and child maltreatment. Findings related to the impact on the couple relationship and child behavioral and emotional functioning are mixed. These outcomes are likely to depend on modifiable family risk factors, including parental psychological functioning and parenting practices. Further research is needed involving longitudinal designs and with more diverse samples and outcomes to assess potential mediators and predictors of family and child adjustment to parental work absences, and to use this information to develop and test effective family-based interventions for these potentially vulnerable group of families. Overall, the research reviewed here has important policy and practice implications for the design and delivery of support services to families experiencing prolonged separation from a parent due to their work arrangements. The Parenting and Family Support Centre is partly funded by royalties stemming from published resources of the Triple P—Positive Parenting Program, which is developed and owned by the University of Queensland (UQ). Royalties are also distributed to the Faculty of Health and Behavioural Sciences at UQ and contributory authors of published Triple P resources. Triple P International (TPI) Pty Ltd. is a private company licensed by UniQuest Pty Ltd. on behalf of UQ, to publish and disseminate Triple P worldwide. The author of this chapter has no share or ownership of TPI. Dr. Dittman is an author on a Triple P program and may in future receive royalties from TPI. TPI had no involvement in the writing of this chapter. Dr. Dittman is an employee at UQ.